BNL Campers Ltd t/a Happy Campers. Within this document Happy Campers website will be referred to as “Site”. 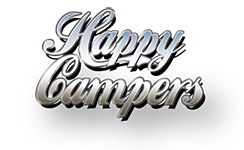 Happy Campers does not collect any personal information about users, except that which is knowingly and specifically supplied to us by the user. Happy Campers is committed to ensuring the privacy of your personal information. www.happycampers.ie has an online form which members of the public can fill out to ask a question or to make contact. Happy Campers will not sell or pass on your information to any other organisation unless you specifically and expressly give us permission to do so. We use Third Party cookies which collects data regarding website analytics such as Google Analytics.. Happy Campers take security very seriously using secure means of transferring and storing any data received. Our administrative and tech support staff are aware and trained in the measures used.